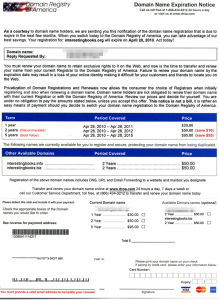 As a domain owner you may receive notifications regarding your domain’s expiration and their renewal. When you receive these notifications it is important to know where you registered your domain name and where the renewal notifications should come from. 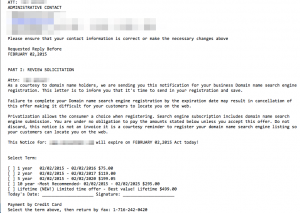 Common domain registrars are Network Solutions, GoDaddy, Hover, eNom, etc. It is important to be able to identify the fake notifications since following the instructions contained within them will cause you to transfer your domain to another entity, causing you to loose control over your own domain name. They may then charge you a premium to get that domain name back. These fake notifications can come in the form snail mail such as the ones from Domain Registry of America. Or more popular, in email form. 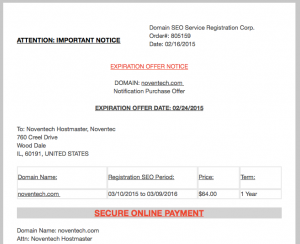 If you need help verifying that a renewal letter came from a legitimate source you can forward it to support@noventech.com or call us at 630-595-5200.